Planning a long-weekend in Oslo? After spending my summer working in Oslo (I normally live in Trondheim, which you can read about here). 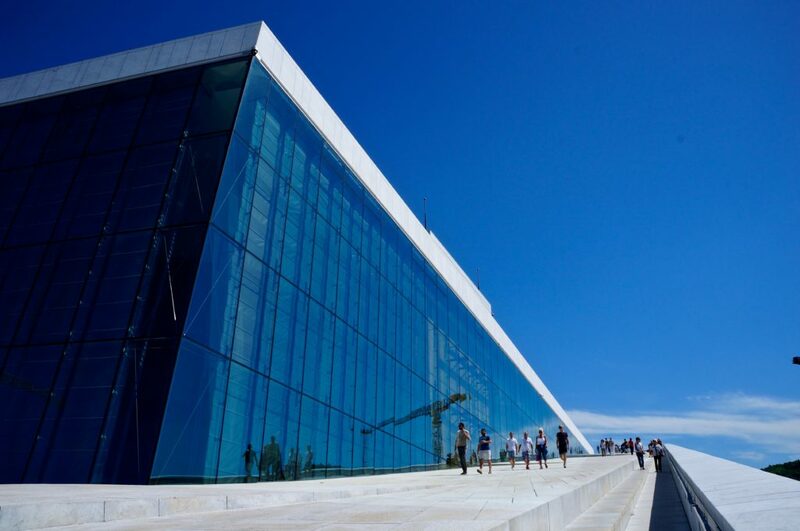 Here is how I would spend 72 hours in Oslo. 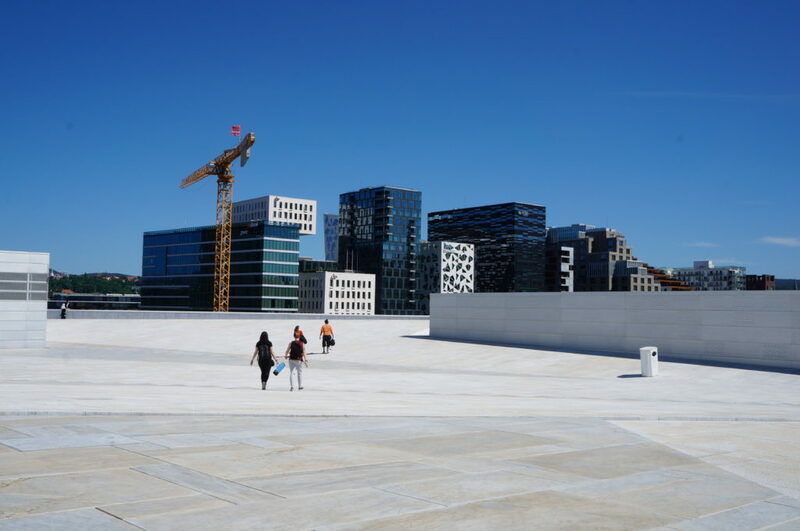 Oslo is the capital of Norway and the biggest city in the country, but compared with other capitals around the world, Oslo is actually quite small. I think 72 hours is the perfect amount of time to spend in the city. 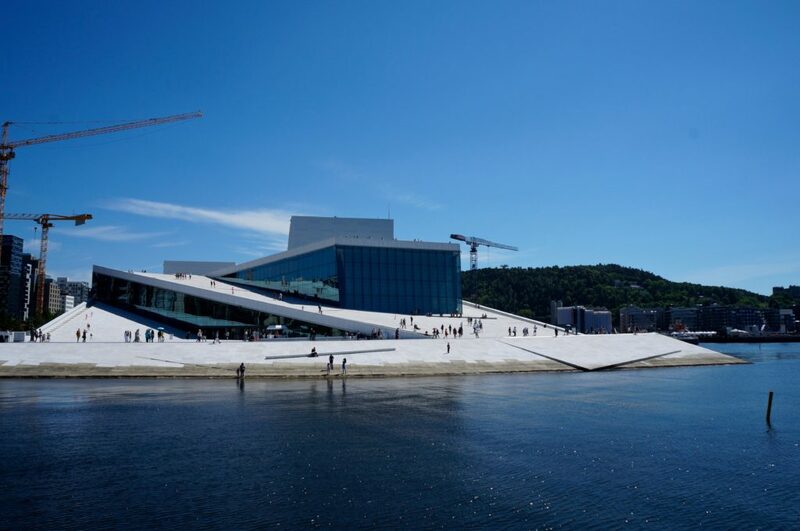 Start the day by checking out Oslo’s stunning Opera House. It opened in 2008, and has been the city’s main attraction since. The amazing architecture has received several rewards. You can even walk on the opera’s roof! There are also daily guided tours inside the opera, or you can just check out the entrance hall for free – which also is quite cool. 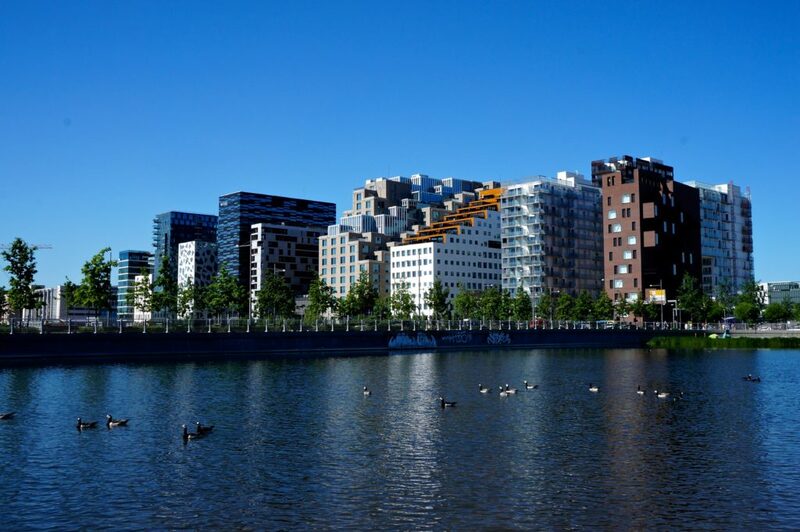 Across the street from the Opera House, you find Oslo Barcode, another example of Oslo’s modern architecture. After checking out the Opera House and Oslo Barcode, walk over to Sørenga (which is connected to the Opera House area by a floating bridge). 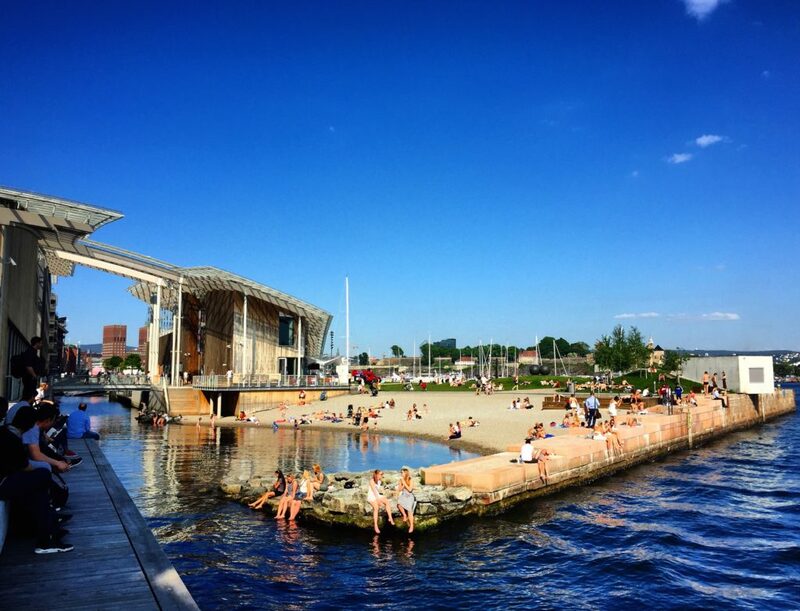 Sørenga is a new-built neighborhood in Oslo, and if you are here on a hot day you can even go swimming at Sørenga city beach (“Sørenga Sjøbad”). 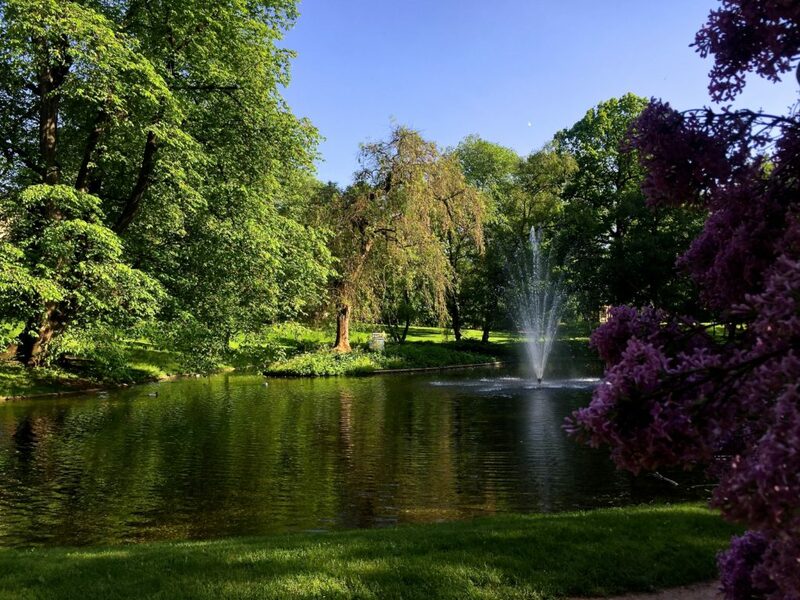 When you are walking back to the city centre, you can stop by The Medieval Park (Middelalderparken) to get the best view of Oslo Barcode. 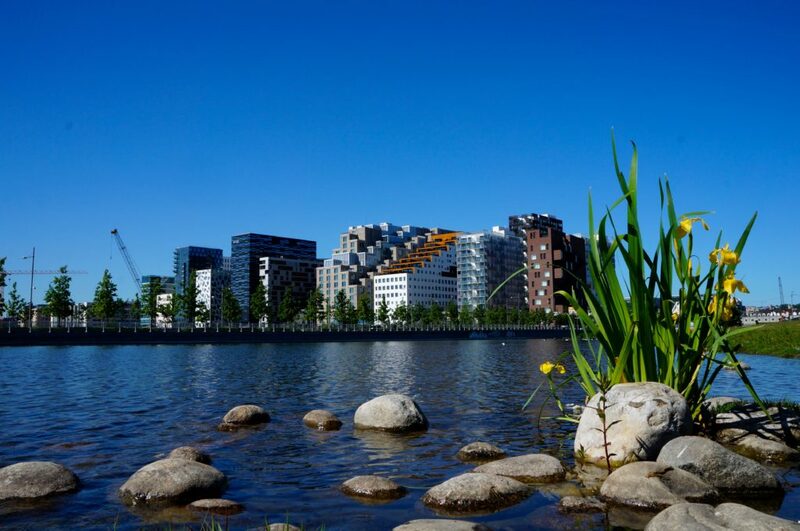 When you have had enough of modern architecture, you should walk up to the more traditional areas of Oslo. Walk the 30 minutes to Grünerløkka, or take the tram. 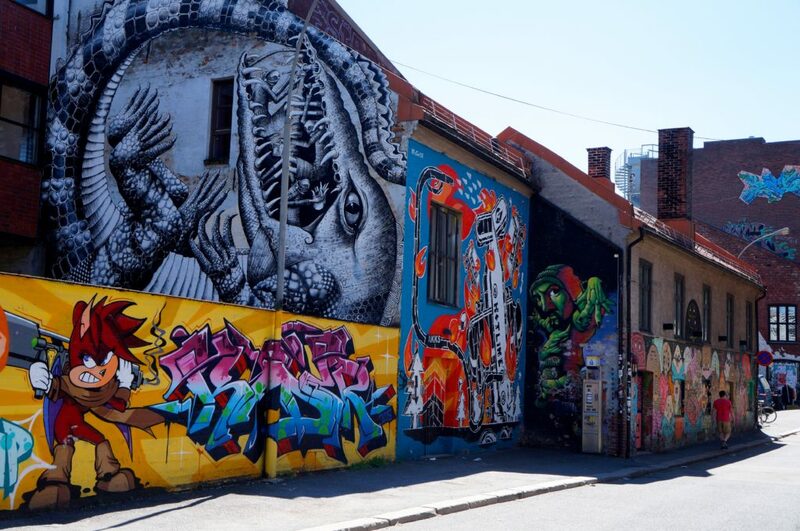 Grünerløkka is the hippest area in Oslo, where you find the coolest cafés, bars and restaurants. 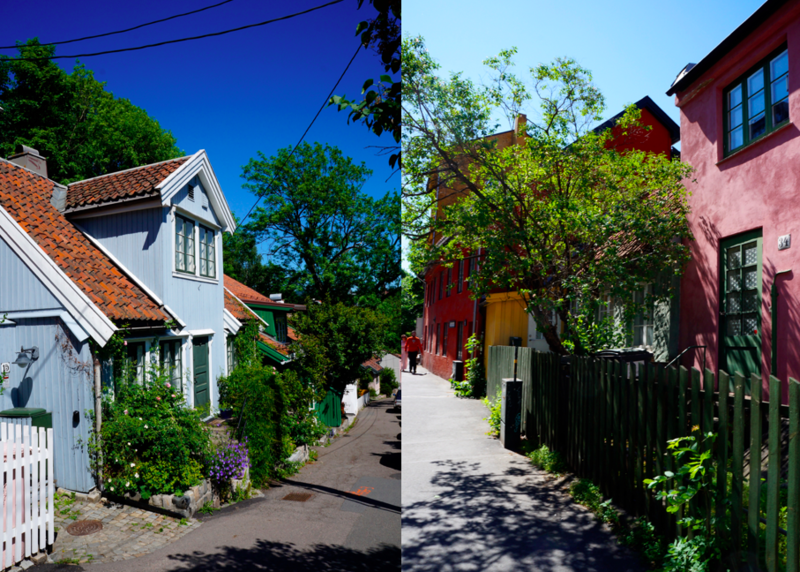 After spending an hour or two soaking up Grünerløkka’s artistic atmosphere, walk further west to St. Hanshaugen. On your walk, you can stop by Mathallen at Vulkan, a great food market with several restaurants and shops. Check also out the nearby Ingens Street’s cool street art. When you arrive at St. Hanshaugen, you should go to the charming streets Telthusbakken and Damstredet, which are the loveliest streets in Oslo. 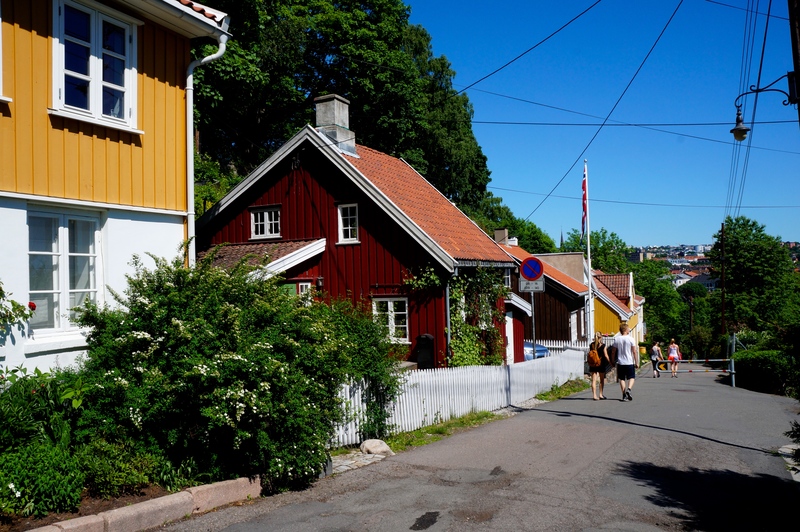 Check out the picturesque, small wooden houses in the area. People are actually living in these houses, can you imagine that? 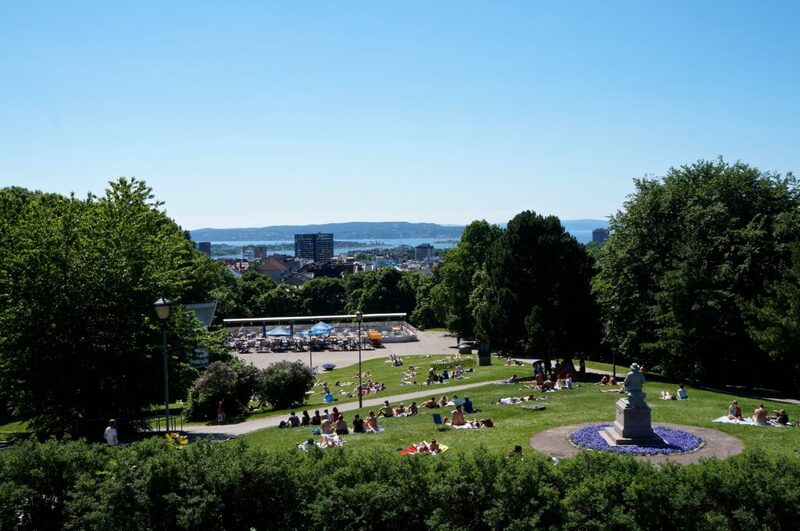 For a great view of Oslo, walk up St. Hanshaugen Park’s hill – this is also a lovely place to relax on a hot day. Start the day by walking up the main tourist street in Oslo, Karl Johan Street, which is leading to the Royal Palace. 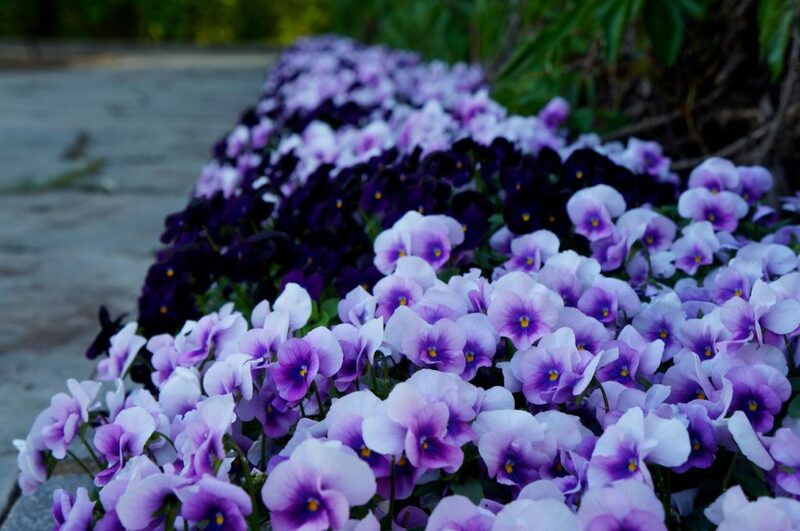 Have a look at the palace, and do not forget to check out its beautiful garden. Next, you can walk down to Oslo City Hall. I do not find the building itself very interesting, but the inside interior and art are supposed to be marvelous. Aker Brygge and Tjuvholmen is located right next to the City Hall. The area is filled with modern architecture, shops and sea view restaurants. 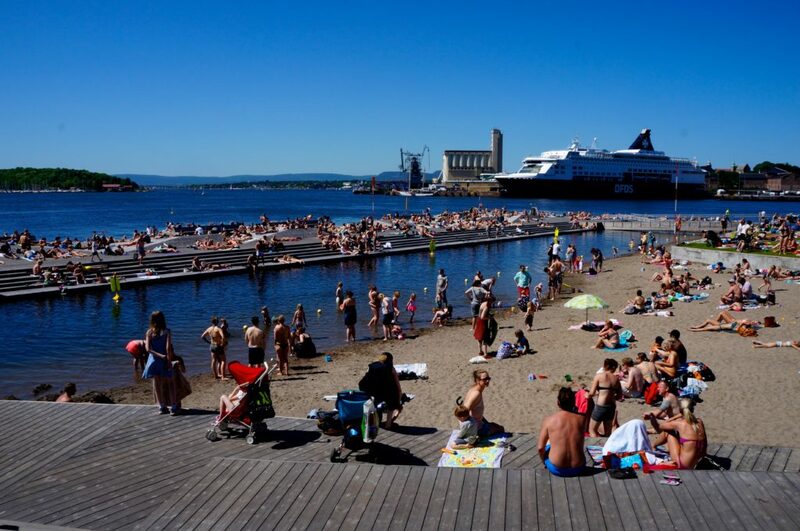 There is also a city beach at Tjuvholmen. 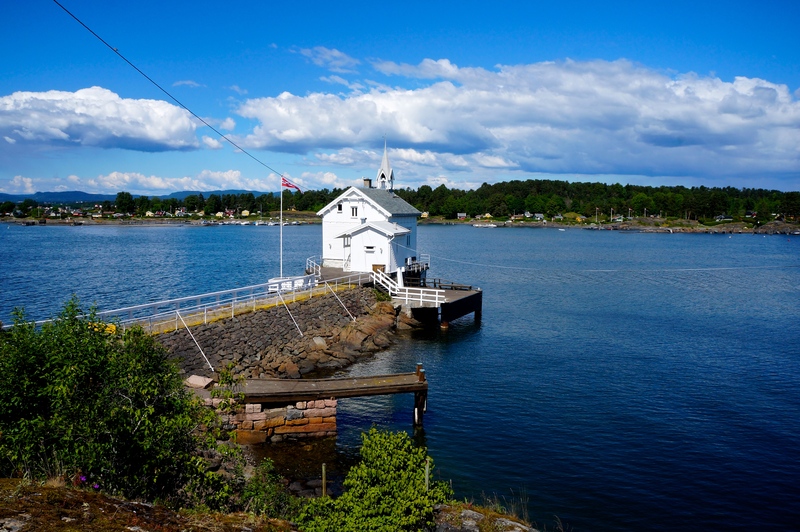 If you are visiting Oslo during the summer, you should take the boat from Akerbrygge to one of the beautiful islands located in the Oslo Fjord. The islands are only a few minutes away, but it feels like you are so far away from the city when you arrive. They are so green, beautiful and peaceful. My favorites are the islands Gressholmen and Lindøya, but the best is to see several islands by going island hopping. 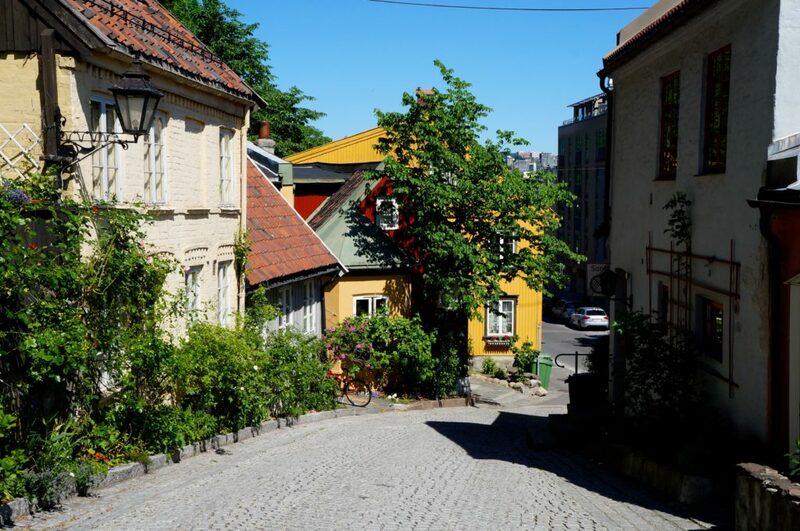 If you are staying in the City Centre, walk up to Bogstad Street, the best shopping street in Oslo. After walking through Bogstad Street, walk to Frogner Park by passing Majorstuen. 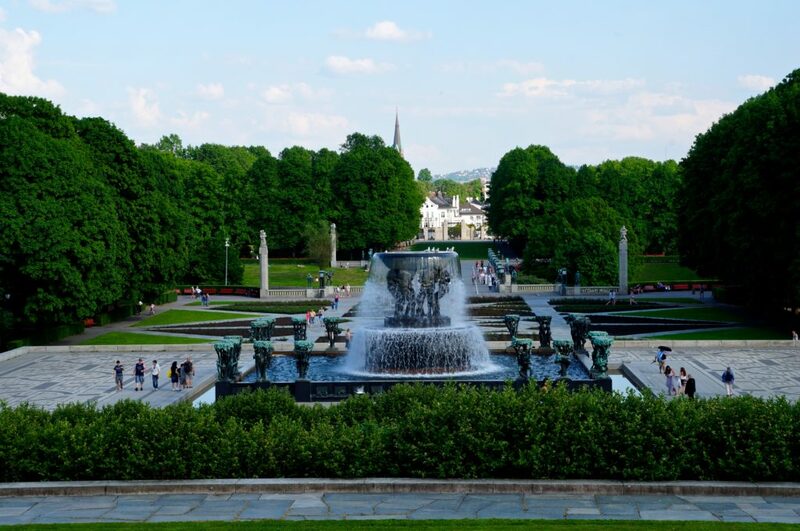 Frogner Park is a huge green area in Oslo, located in one of Oslo’s more exclusive areas. Check out Frogner Manor, a historical building from the 18th century. 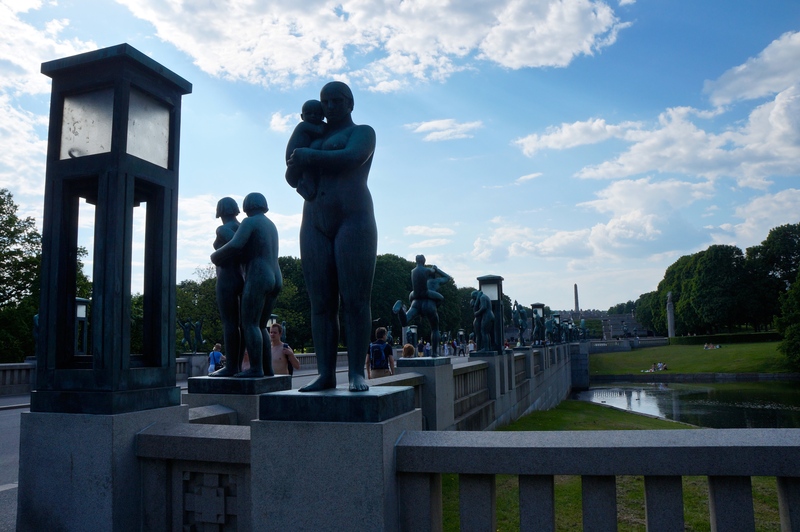 In the center of the park, you find the Vigeland Installation, a stunning sculpture installation made by the artist Gustav Vigeland. 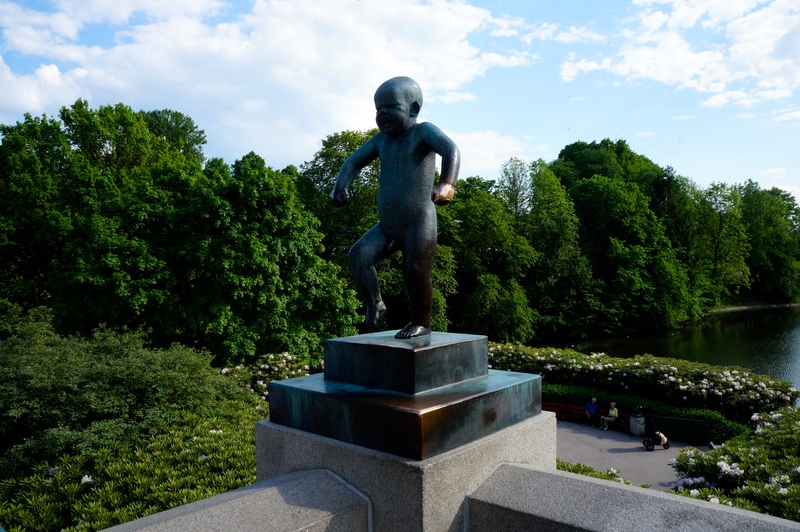 After checking out the sculptures, take the subway from Majorstuen to Frognerseteren. Frognerseteren is located in Nordmarka, a popular hiking area. By going here, you can both enjoy Oslo’s nature as well as the view of Oslo. – Døgnvill Burger has the most amazing burgers ever. The restaurants have two locations, at Tjuvholmen and Vulkan/Mathallen. – Check out the area Grønland for cheap restaurants. – Olivia Restaurant has great pizzas, and are located in Bogstad Street, at Tjuvholmen and at Akerbrygge. – Dinner Restaurant has great high-end Chinese food. – Baremas is a good place for tapas. 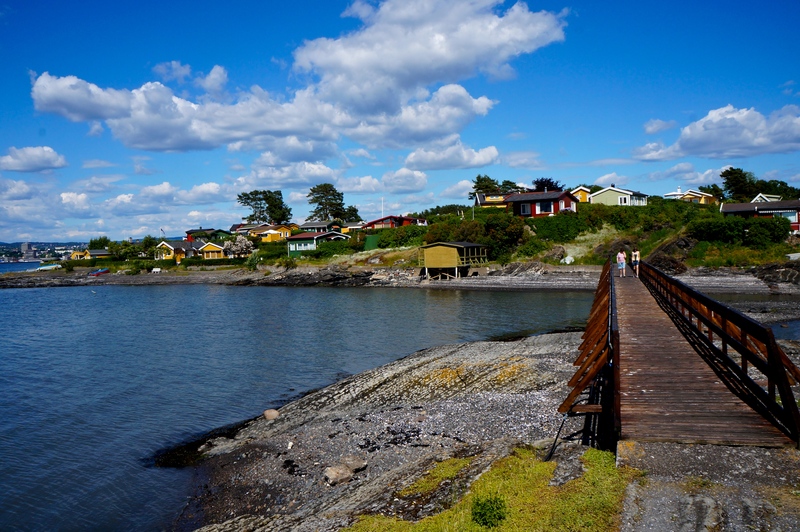 – Festningen Restaurant is a good restaurant for decent food and a great ocean view. – “Den Glade Gris” (The happy big) has some great pork specialities. 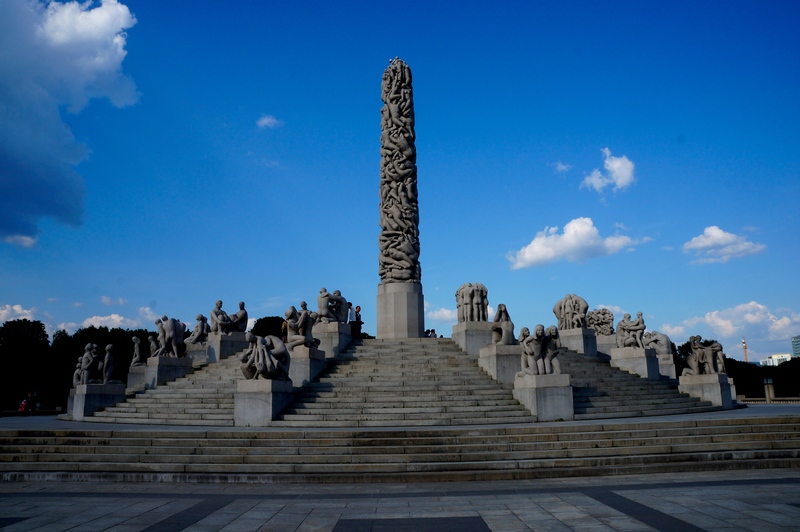 This entry was posted in My travel guides, Norway and tagged Norway, Oslo, Travel, travelguide, weekend by Maria's Adventure. Bookmark the permalink. Enjoyed reading your post and will use your suggestions when l visit in the summer. Could you recommend the best area to stay so my son and l are able to get to all these lovely places? Do you know of any vintage shops/markets nearby also? Thank you for your help. I look forward to hearing from you. I’m happy to hear that! You can stay everywhere in the city center. I would prefer to stay on the west side of the main street (Karl Johan), but as long as you stay in the center you can walk almost everywhere in Oslo. If not, you can take the tram/subway/bus – which is very convenient. For vintage shops I would recommend “Grunerløkka” neighborhood, where you will find several small vintage shops in the streets. There are also a Sunday market at “Birkelunden” in the same area. Thank you very much for your reply, that’s very helpful.